If you like CW DX, the ARRL's International DX CW Contest keeps the DX aiming in your direction. With propagation so good lately, this might be a good weekend to spend on the radio. I never fail to recommend the North American QSO Party events and there's a good one for new RTTY operators next weekend. No errors to report in the previous issue. There have been some changes in the ARRL Contest Branch following the January 23rd resignation of Mike DeChristopher, N1TA, as ARRL Contest Manager. Former Contest Branch Manager, Sean Kutzko, KX9X, catches us up on the situation. "Since Mike's resignation, a team of ARRL staffers, including former Contest Managers Dan Henderson, N1ND and myself, have come together to address the needs of the Contest Branch until a replacement is found. Dave Patton, NN1N, is managing this team. 3) Restore the "customer service" side of the Contest Branch to superior levels. "With the help of several ARRL staffers in the Awards Branch, we have sent out over 5,000 awards certificates in the last two weeks, including the 2012 CW and Phone Sweepstakes, the 2012 September VHF Contest, the 2012 August UHF Contest, the 2013 RTTY Roundup. 1,100 certificates for the 2012 10 Meter Contest were just sent to the ARRL mail room and should go out by the middle of the week. 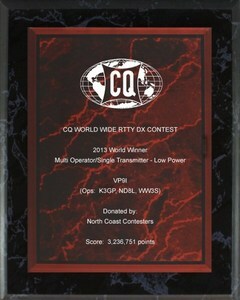 In addition, plaques for the 2012 CW Sweepstakes and 2013 RTTY Roundup were shipped. 2012 Phone Sweepstakes plaques were ordered last week and will be shipped within three weeks. We will continue to aggressively work on the backlog of overdue awards and hope to be caught up soon. You are welcome to monitor our awards progress at www.arrl.org/plaques-and-certificates which is updated regularly. "We do not foresee any delays in publication of contest results online or in QST. In addition, several results tables, log checking reports and databases have been uploaded to www.arrl.org/contest-results-articles in the last two weeks. "Finally, we are working together to take care of customer service inquiries to the Contest Branch and reply as rapidly as possible. We are disappointed with the delays in communications and awards fulfillment that contesters have experienced. The past few months have not been up to ARRL standards; we apologize for this and are working hard to correct it. The "Latitude 13" team of Tom Georgens, W2SC/8P1A/8P5A and Dave Mueller, N2NL/NH2T. So named because the locations from which the two operators usually compete are both at 13 degrees latitude. "RadioTeam Azores" sponsored by the Azores Tourism Association consists of contesting legends Martti Lane, OH2BH, and Ville Hiilesmaa, OH2MM, both frequent operators from the Azores. The "Brazil-Bulgaria Friendship Team" is sponsored by a consortium that includes The Araucaria DX Group, Triumph IESA Infrastructure AS, the Sao Paulo section of LABRE, K1LZ, and the Bulgarian Federation of Radio Amateurs (BFRA). They have appointed Soni Leite, PY1NX, and Atasnas "Nasko" Koitchev, LZ3YY/LZ9R, as their team. The fourth and final Team Sponsorship will be made available through an auction to be conducted March 8, 2014. Anyone interested in participating in the auction should contact WRTC Chairman, Doug Grant, K1DG, as quickly as possible to register. DX Engineering is now the exclusive source for KD9SV Products Low Band receive transformers, preamplifiers, antenna switching units and other products. KD9SV Products for Low Band receiving antenna systems are well-known and have been used by DXers and contesters for over 25 years. JVC Kenwood has purchased the E.F. Johnson Company. EFJ has been manufacturing radios for a long time and you'll see the hamfest vintage equipment tables loaded with Johnson Rangers and Vikings and Thunderbolts while their Matchbox antenna tuners are still doing the job in antenna systems across the land. Lately, EFJ has been better known for its P25 VHF/UHF equipment used in public safety communication systems. Bill K3WA found this interesting QSOMap web site in development that will take ADIF or LoTW logs and create a world map with pins. You apply various filters such as band, mode, and so forth. Bill used it to map out his QRP DXCC contacts, for example. To celebrate 35 years of the founding of the Cayman Amateur Radio Society, its members have been authorized by the ICTA to use ZF35 prefixes through January 19, 2015. Make sure your CTY files are updated to handle the new prefixes! Tom K1KI discovered this article about scanning your brain on overload. Does this count as a decoder? Web Site of the Week - Ian G3NRW has updated the Band Utilization Charts for 30 meters, 60 meter UK allocations, and 160 meters. He asks to be notified by email if you know of anything that needs updating. He reminds us that these charts are not band plans, they are just indicators of actual band utilization. Jump ball - what happens when a North American Sprint QSO ends and several stations call to make the QSO and acquire the frequency. See the Operating Tip section for more about Sprint-style operation. Terry W8ZN and Andy K1RA activated the Grid Pirates Contest Group call sign K8GP as a rover in the ARRL January VHF Contest and put together a musical video exploration of the highways and byways on their route. The full story is online, too. The extended writeup by Jeff K1TEO for the ARRL September VHF Contest has been published on the Contest Results Articles page. Part of the catching up process noted above, Log Checking Reports are now available for the 2013 ARRL June VHF and August UHF contests. While some ARRL RTTY Roundup log submitters received "late" notices from the email log-handling robot software on the final day before the deadline, all RTTY Roundup logs were accepted through Friday, February 7th. If you have any question about whether your log was accepted, check the ARRL's Logs Received page to be sure your log is listed there. Ray ND8L reminds us that many sponsorship opportunities remain for 2013-2014 CQ WW RTTY plaques and 2014 CQ WW WPX plaques. The cost for these attractive plaques for US categories is $65.00. For the plaques that must be shipped internationally the cost increases to $75.00. Call CQ! If the action is just too fast and furious, find a clear spot and call CQ. Somebody will find you! Don't forget that after calling CQ results in a QSO you have to move 5 kHz before you can CQ again or 1 kHz to call someone else. At the end of a CQ, follow your call with "NA" on CW or "Sprint" on phone so other sprinters don't assume you're calling some other station. If you can set up your logging software this way or just remember to do it, follow the sprint conventions sending your call sign in the exchange: If you called CQ and are responding to a caller, send their call followed by your call, number, name, and QTH. If you are responding to a CQ'ers exchange, send your call at the end of your exchange. Doing so alerts the other sprinters that you will be inheriting the frequency and...jump ball! Don't forget to acknowledge that you received the information in the exchange. On CW, send "R" or something long enough to be heard through the din. On phone, "Thanks" will do. If you don't acknowledge or send something too short (like a single "dit") the other station may not log your QSO, resulting in a Not-In-the-Log (NIL) for you! How much air flow is enough through an amplifier tube or tube chimney? Roger K8RI suggests just start by measuring pressure drop across the tube using the simple manometer design in the ARRL Handbook. If the pressure drop is right, then by definition you have the right amount of air flow. You might not want to run a blower at full throttle all the time since they can be pretty noisy. Roger's solution is to use a temperature sensor in the exhaust air to control a high/low setting for the blower. A switch to put the blower on HIGH will be helpful during digital operation. 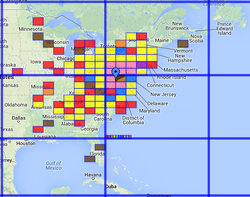 John G4ATA's nice web page on low-band 4-squares and other arrays has been updated after a period of inactivity. 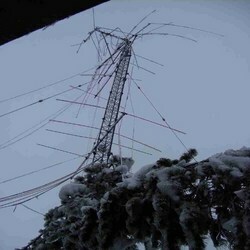 He has plans for a new 4-square on 40 meters for a portable operation in the CQ WPX Phone contest and will be testing it during the preceding Russian DX Contest. During my recent visit to the Arecibo Observatory, I noticed some new antennas at the bottom of the big dish shown in the photo at right. 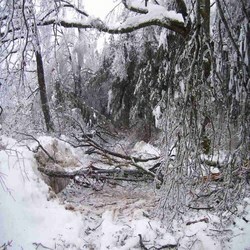 I dropped an email to Dr. Jim Breakall, better known as WA3FET, who explained his latest project. "There are 3 crossed-dipoles for 5.1 MHz and another 3 for 8.175 MHz forming an array that will beam energy up to a net mesh reflector that will hang from the 3 big towers. This "cassegrain" reflector will then reflect energy back down to the 1000-foot dish and beam 100s of megawatts up to the ionosphere to modify it. Each of the dipoles is fed from a 100 kW transmitter giving a total transmitted power of 600 kW. 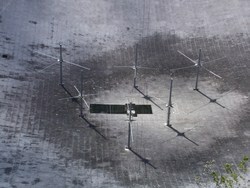 With the gain of the dish even at HF, that produces 100s of megawatts." I wonder if he could split the difference and get on 40 meters during Sweepstakes! Any teachers of analog circuit design reading this issue? I know you're out there...I have been such an instructor and enjoyed this flyer from Analog Devices features their tools for helping students effectively learn analog design. Whether you use the Analog Devices gear or not, there is plenty to consider about the types of tools to use. Technical Web Site of the Week - This Microwaves & RF magazine article on using origami paper-folding techniques to compress antennas is a great example of innovative thinking. As technology continues to drive widespread change throughout ham radio, radiosport is by no means immune. In fact, radiosport is on the "bleeding edge" of those changes in many instances. 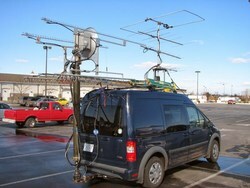 While adopting and inventing new technology is an important aspect of radiosport -- and of ham radio, generally -- it also presents continual challenges to our assumptions about how competitions are defined and organized. A lot has changed since the early days of contesting when the edgy technology discussions were about 2 meter AM alerting channels and learning to hold the logging pencil while you sent code with a Hallicrafters HA-1 electronic keyer and single-lever paddle. Yet by and large, our categories are still more or less as they were a half-century ago with the sometimes-grudging addition of "assisted" classifications that create more confusion than clarity. Onward into the 21st century -- do the new technologies of ubiquitous data and computer-controlled multi-radio shacks require a completely new game? Certainly, novel types of contests can and will be created but it's still necessary to agree on the basic definitions and relationships. That's usually where the trouble, er, fun begins. Addressing these questions is the topic of this multi-part series with the intent of encouraging discussions of where and how we go forward from here. The basic architecture of radiosport contesting is defined by the following things; boundaries, the information that crosses them, the equipment within those boundaries, and the operation of that equipment. Boundaries are the standard lines-on-a-map that have been around a long time. For instance, the CQ World Wide Contest rules require all of the equipment to be within a 500-meter diameter circle and the ARRL's Affiliated Club Competition rules specify a 175-mile diameter circle for Unlimited and Medium clubs. Circles seem popular! We understand physical boundaries but what about other types? Abstract sorts of boundaries might also apply to off-site computing services or data-sharing in cyberspace somehow. Future contests will have to address these and similar issues. Information means any data or signals pertaining to other stations participating in the contest. This is a more inclusive way of referring to all of the radio signals, spotting information, Internet messages, telephone calls, etc that relate to what a station is doing, on or off the air. Contest rules can limit what information can be produced (power limits, bands of operation), what information can be received (limits on spots and non-radio communications like telephone calls), and specify what information must be exchanged and recorded. Contest rules can restrict the information allowed to cross boundaries, as well, and in either direction -- either incoming or outgoing. Equipment is any device or program used to generate, process, transmit, or receive information. Another broad group, this includes everything from the antenna to the software used to log contacts. Some contests place no restrictions on equipment -- use whatever you have. Other contests restrict the use of certain types of equipment, such as automated decoders or lockout devices. Stations consist of equipment within a boundary defined by the contest sponsor. Operation is the exercise of a control function on any of the equipment or use of information to affect a submitted log or score. In other words, how the equipment and information are used in order to produce the contest entry. Operators are the entities (human or otherwise) that engage in operation. Well, duh! Why that fine distinction? Some contests might restrict the use of automated devices that perform control functions, such as spotting other stations. Or perhaps the rules specify whether the operator must be physically located within the station boundary. That's plenty to get us started. It seems awfully basic but so are bricks and that's what buildings are made of. Creating a sturdy building requires good bricks and a plan for using them. And that's where we will pick up the thread next time!